Massachusetts commuters struggled through a hard January, as a record four feet of snow slammed the region, making for dangerous drives, difficult walking and weary spirits. As February moves in, both the snowbanks and frustrations keep growing – making it even more important to plan before heading outside, especially if you commute to work. The risk for car accidents increases in the snow and approximately 70 percent of all winter deaths related to snow and ice occur in automobiles, according to the Massachusetts Emergency Management Agency. Have a well-stocked Winter Emergency Car Kit. It should include a flashlight with extra batteries, cell phone charger, first-aid kit, windshield scraper and brush, shovel and a brightly colored cloth to use as a flag. Click here for other items to include. If you drive, travel during daylight hours. Consider commuting with a co-worker on the most difficult days. Slow down on the road. Many times, hazards such as black ice cannot be seen until it’s too late. Be extra cautious driving around bends in the road. The tall snowbanks have narrowed the roadways, leaving less room for both you and other cars, increasing the chance for car accidents on snow and ice. Give the snow plows extra room to work. Be aware you may have to slow down for pedestrians in areas where sidewalks aren’t shoveled. Keep your car’s gas tank at least half-full. 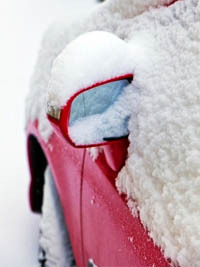 Make sure your car has good winter tires with adequate tread and pressure. If you do have to stop your car on the highway, stay calm. Pull off the road and turn off the hazard lights. Take the brightly colored distress flag from your snow emergency kit and tie it to your radio antenna or window. Call the local police and your local auto club for assistance. Tagged: "Boston personal injury lawyers", "car accidents", "Massachusetts snow and ice accident lawyers" and "snow and ice accidents"